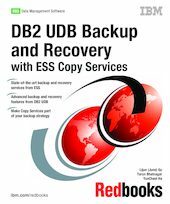 This IBM Redbooks publication describes how customers can use the IBM TotalStorage Enterprise Storage Server’s Advanced Copy Services to perform a snapshot backup and recovery in an IBM DB2 UDB Windows environment. Of these Copy Services, FlashCopy, is capable of performing backups of multi-terabyte databases in minutes. It can also help improve uptime by providing the ability to recover in minutes. Another Copy Service, Peer-to-Peer Remote Copy (PPRC), provides a synchronous remote mirror to protect against disasters. When used in combination, these two Copy Services have the ability to provide multiple instant copies of the database and still protect against disaster. IBM DB2 UDB is a universal database supporting a wide variety of platforms and applications. With every new release, DB2 UDB continues to grow in the enterprise-class server segment. When a database is used for mission-critical applications, it requires an enterprise-class storage subsystem. The Enterprise Storage Server (ESS) can provide the reliability, scalability, and features required for mission-critical applications. This book also provides general information about ESS and DB2 UDB.